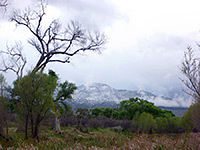 Near the twin towns of Clarkdale and Cottonwood in central Arizona, Dead Horse Ranch State Park occupies a stretch of wooded, riparian land between the Verde River and the arid slopes that rise up to the northeast - a pleasant if unremarkable landscape that also includes meadows, streams and three artificially maintained lagoons, all within sight of the much higher peaks of the Black Hills to the south. This is primarily a park for recreation, especially camping - offering a tent site, an RV campground and camping cabins - and fishing, for catfish, trout, bass and bluegill. Other activities are canoeing, kayaking, picnicking, horse riding, cycling and bird watching, with nearly 200 species being observed here. Several short hike and/or bike trails wind through the overgrown terrain near the river, linking with longer routes into the hills (part of the Coconino National Forest), and one extended cross-country trail that leads all the way to Red Rock State Park near Sedona. The park is certainly popular, though not so interesting for day use visitors. It is named after a ranch that once stood here, a property that when purchased in the 1940s (by the Ireys family from Minnesota), had a dead horse lying outside. The approach to Dead Horse Ranch State Park is from N 10th Street in Cottonwood, a road which crosses the Verde River and dead ends at Blazin M Ranch, a dining and entertainment establishment. A right turn soon after the bridge passes the state park entrance station, often unstaffed in which case payment ($7 per vehicle for day use in 2011) is via self-service machines near the campground, then continues east another mile to the lagoons, ending at a group of office buildings, just before the point where the hills encroach all the way to the river banks. En route are several short side roads, plus trailheads, picnic areas, parking areas and other facilities. 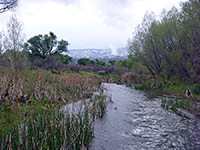 The river corridor is accessed by a number of paths, principally the Verde River Greenway Trail, named for a protected section of the river that extends several more miles either side of the state park. The surroundings are quite overgrown, with bushes, willow and tall cottonwood trees, part of a belt of greenery about 500 feet across. 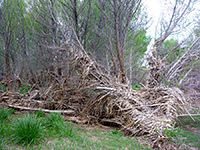 The river often splits into two or more channels, and is very prone to flooding, as shown by driftwood and other debris piled against tree trunks several feet above the normal water level in this rather wide valley. 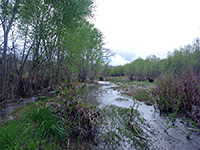 The south side of the river has a similar appearance to the section within the state park, and may be seen without payment by walking in from a parking area near a sports center (Cottonwood Riverfront Park), a short distance along 10th Street.